When it comes to buying gifts, sometimes it can be difficult if the person has allergies or is vegan/vegetarian. It makes food related pressies difficult. And it can also make skincare and make up purchases difficult too! Lush is one of my favourite places to buy eco friendly, vegan and vegetarian Xmas purchases. Their products are "naked" (free of unnecessary packaging), their ingredients are sourced ethically and they they don't work with businesses that do animal testing (eg they won't purchase ingredients from a company that does animal testing). Every year they release a fantastic range of limited edition Xmas products (including their famous "Snow Fairy" shower gel) and some wonderful pre-packaged gifts that range from $11.95 all the way up to $185.00. What's wonderful about the gifts is the fact that they're already packaged beautifully, so you don't have to worry about making sure that you have wrapping paper/bows/sticky tape! The Rose Jam Shower Gel is a limited edition product, but all of the other items are available always, so if you get addicted to it you don't have to wait until next Xmas to get more! The Rose Jam Shower smells beautiful. The scent lasts for quite a while on the skin. I like to either use this in the shower or use it as a hand wash. All of Lush's shower gels are multi purpose. I've had a friend that used to add a small amount of Snow Fairy into her washing machine to make her clothes smell nice. I've Snow Fairy and also their shampoo "I Love Juicy" as an environmentally friendly floor cleaner (the citrus ingredients cuts through grease quickly). What's great about this gift is the fact that it's all shower and body products, so it doesn't matter if the person does or doesn't have a bath in their home. There is also a great mix of products. Some people prefer thicker moisturisers (like Ro's Argan Body Conditioner), while others like a lightweight body lotion (like Vanilla Dee-Lite). You can use the products all year round depending on the season and what your body needs. This gift pack costs $57.50. You can see all the Christmas packs and limited edition products here. If you have a boyfriend/hubby/brother/father that is hopeless at gift giving, then send him into Lush as the staff there will be able to point him in the right direction! Do you have any friends or family members that are Lush addicts? This pack looks lovely! 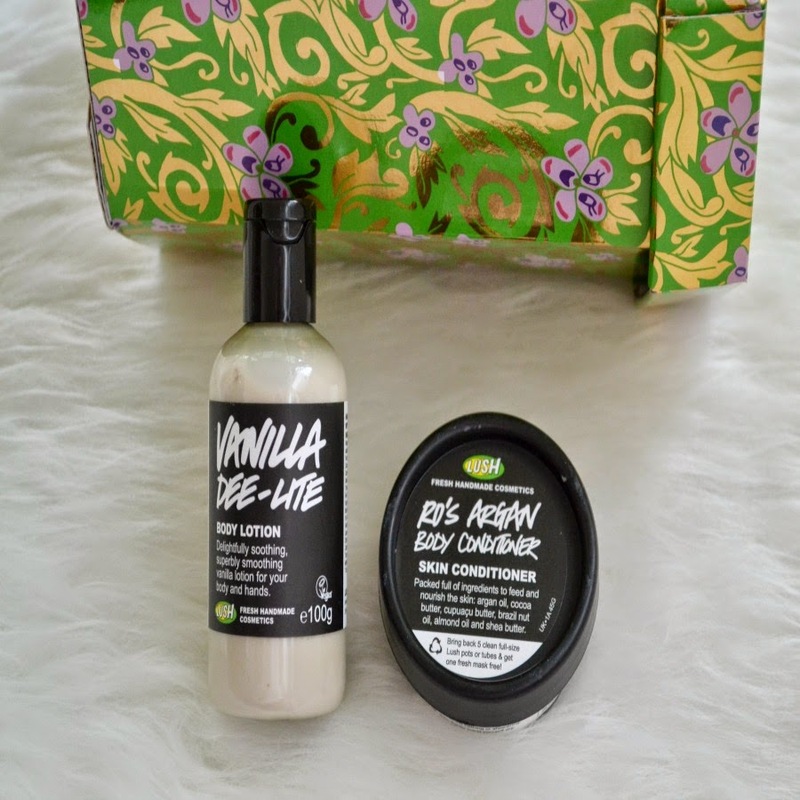 I've heard really amazing things about the Rose Jam scent, and the body conditioner as well! I tend not to take baths very much at all, so I think this set would be great! Their Christmas things are amazing. I'm hoping to pick up some more xmas products in their boxing day sales. The feeling of the shower smoothie is soooooo lovely. It's wonderful for dry skin.